A few thoughts on the Arsenal 0-0 Sunderland league match | "It's all about the Arsenal"
Hello Gooners. 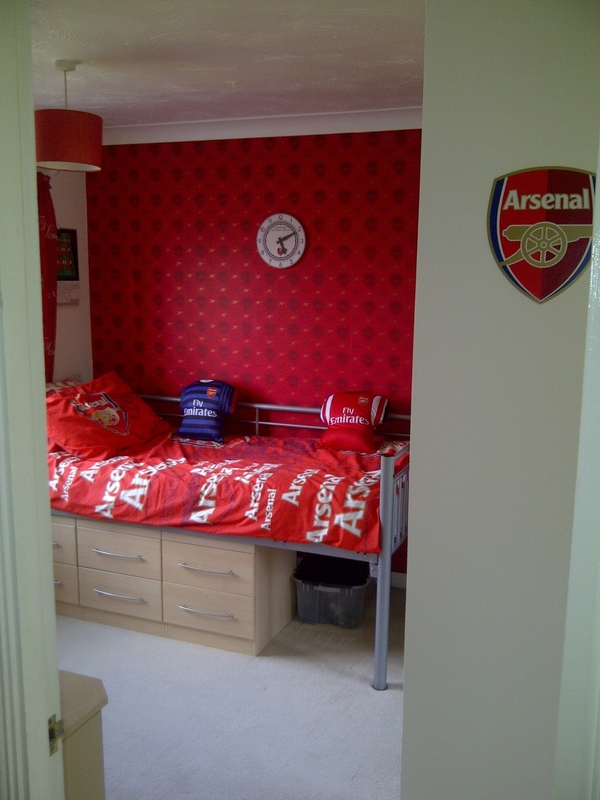 Been away from blogging for a few weeks, due to decorating the boy’s room all things AFC and a break in Norfolk. Cazorla, Giroud and Podolski in. RVP and Songhino out. Talk of two more coming in and maybe Squill, Nicky B and a few others on way out. After the very tasty burger we make our way into the Armoury to get Luke the new away kit. Wanted to get curtains for his bedroom only could not see them in the shop and it was packed to the rafters, the tills were going Ka-Ching Ka-Ching. Had to queue for 20 mins to pay for his shirt and boy was it hot in there. Plenty of red home and purple away kits being worn and the Emirates looked great inside and out on such a lovely day. Sitting in my seat 40 mins before kick off, you realise just how late people today get to their seats as five mins before kick off the stadium was half empty. The old days of the North Bank and Clock End well gone when the fans were in the ground singing songs and getting the atmosphere going. The teams come out and to applause more like being at Wimbledon Tennis. The section that was created as a singing section for Red Action was once again non-existent. they only are up for certain games and quite frankly I found the atmosphere for opening match of season flat as a pancake. No RVP having been sold to United. £24m seems a good deal. RVP is a superb footballer but though he scored 130 goals over seven seasons, injury meant until last season he was not a regular. AFC stood by him, paid him for attending the treatment room. Had he had two more seasons like last years in the previous six seasons, he might not have been able to argue about lack of trophies. However a total outlay of £70m inc salary etc for a 29-year-old on 4 year contract tells you a lot about the football finance today. After 20 seconds the ball was played out to Theo who only had to trap the ball at waist height, not a problem for a footballer who thinks he is worth £100k a week you’d think. Don’t be silly, Theo’s control is awful and off it goes for Sunderland throw in. Theo did not get any better. The bright spark was Cazorla who though diminutive has great close control and a cracking eye for a pass. After good work by Diaby the ball came to Cazorla who hit a fine shot that was well saved. The it was Gerviniho’s turn to be supplier for Cazorla when he passed into the area and both Podolski and Cazorla went for the shot, only for it to go wide of post. For ten minutes Sunderland played football and then decided to employ the tried and trusted Chelsea Champions League tactic and parked the bus, train, plane in front of goal. Niggly fouls. Staying down when fouled. Keeper taking his time on free kicks. Sunderland did not even get one corner in the whole match, apparently the only team in all four divisions not to get one. However, that’s Martin O’Neill for you, take no chances, play safe, mainly why he wins sod all. The hot weather, they say 38c at pitch level seemed to take its toll. Easier to defend in such weather and save Cazorla, AFC had no real creativity to open up Sunderland’s packed defensive ranks. Cazorla had a good shot saved by the goalie and then after good work by Diaby seemed to take a chance of Podolski’s feet and his shot went wide off left hand post. Theo then had a shot blocked that went for a corner and then another followed but nothing came of either. Blimey how’s that for something you don’t see to often, a cross and there is Theo getting up for a header that goes over. A minute later and both Gervinho and Theo (again) missed chances. The game was getting frustrating and Sunderland were falling further and further back, that I fully expected them to be sitting in the North Bank watching the game any moment. Diaby’s turn to now to have a go and thought it looked like his shot was mis-hit, it crawled along the deck and almost took the keeper by surprise and he managed to get a hand to the ball to turn it round the post for a corner. Quite a few chances (half) and yet I did not get the feeling it was pressure, pressure, pressure and a goal was coming. On the half hour a free kick to AFC was taken by Arteta but just flew over the bar. Good work and pass from Diaby, put’s in Theo, who lays the ball back to Podolski and just as I was thinking 1-0, a good tackle by Sunderland defender puts the ball out for a corner. Not the sort of half you’d hope AFC started on, it was poor and the team looked disjointed. No real threat at all. The announcer mentioned that if you spend £50 in the club shop you will get a gold medal. I said to the boy, we’ll go back after the game and get your curtains and cushions if we can, that’ll push the total over £50 and you can get the medal. Sunderland come out for the second half in a fleet of buses defending the North Bank. Early chance for TV5 is blocked. Cazorla, Podolski and Gervinho all have chances blocked as those buses keep doing their jobs. I was hoping Blakey would pop in and tell Stan & Jack to get those buses out… On 60 mins the ball is crossed by Gibbs into Theo’s path and Theo suddenly thinks he is Marco Van Basten and fluffs his lines by shooting wide. Cazorla with another assist that Gervinho now has blocked. It’s shaping up for 0-0. Sunderland have not been in our half and they are trying every trick in the book with time-wasting and feigning injury and yet the ref looks un-interested in any complaints AFC might have. Surely there will be at least 8 mins added time. Ramsey comes on for Diaby, who goes off with no injury which is a good sign. Played well did Diaby and hopefully will get stronger as the season progresses and stay free of injury. Straight away Ramsey has a shot blocked with yet another assisted pass from Cazorla. Corporal Jenkinson crosses and Giroud on for Podolski fires high and wide. Arshavin comes on for Theo and arsenal back up to 11 player for first time in match, well 10.5. Ramsey’s turn to have a shot and yet again flies high, wide and handsome. I am getting bored with this match, after so looking forward to the start of the season. Not just because AFC not winning, more the lack of anything that shows Sunderland have any intent of trying to cross the half way line, Yes I know we should break then down, but this is anti-football at it’s worse. Jesus to think travelling a round 550 miles to watch this crap. Chance of the match and AFC’s only real glimmer of opening up Sunderland (Cazorla) feeds a superb through ball to Giroud, up, up, up, up out the seat. Almost standing all done slow-mo, this is it!!!! Arrrggghhhh!!! Giroud has only gone and shot wide, when that should have been 1-0, a quick silent Bollox in my head, can’t swear with the boy next to me and slump back down into seat. Frustrated Gooner in front of me, stands and decrees we’ll not even get in top six and gets the laughter his comment deserved. Game drawing to a close, Ramsey & Gervinho have two final efforts that come to nothing, all subs made and I’m expecting at least 8 mins added time and the board goes up 4MINS!!! You’re having a Giraffe fourth official… Not that we would have scored had he put up another 90 mins. Very disappointing day. All in all when the dust has settled, sometimes it’s best to give yourself some thinking time. The team needs to gel. The pre-season build up was not the best, from 29 July till 18 August we had one game v Cologne and that was not enough. I think it’s going to be at least the end of September till the side click and hopefully until then we can pick up points to keep us there or there abouts. Cazorla was a major plus. Gervinho played well with no real final ball or effort that looked like he might score. Arteta was efficient. The defence could have got their sun-loungers out for all they were going to do. Theo was a waste of space and it is so annoying. The thing with Theo, everyone wants him to do well and backs him. Then just as the fans are getting a bit bored and frustrated with him, he suddenly produces a few games where he scores and assists and all is forgotten. Well its six years, so start earning your money Theo. Pod and Giroud played as you would expect of players just brought in and no real pre-season warm up. Diaby looked good in patches and needs to start releasing the ball at the right time, but good to see him get through 70 mins injury free. The team lacked sharpness and quality in the final third and never really looked likely to break the bus station down. Next up Stoke RFC and that should be a battle. We’re going to have to be a bit more clever to get three points there. The usual rubbish from the media attacking everything that can about the team and more so as RVP has left. We played games where he did not score last season and we drew our first game last season 0-0, only this time two players have not picked up three match bans. Went into Armoury to get rest of Luke’s stuff and got it all this time, the total coming to over £80 in total over two visits before and after match. No more than expected the people on the till were saying it should be one transaction for the Gold medal (which is more bronze and means nothing. I felt I had a fleet of buses in front of me defending the medal… After some debate a shop floor manager came to the scene and instantly declared that it made sense to supply me with a medal as I has spent over £50… AFC need to up their game in this area as well as in front of goal. Liverpool lose 3-0 with Brendon Rogers in charge, while Swansea win 5-0 with Laudrup in charge. Tottenham lose 2-1, Man City and Chelsea get expected wins and then Everton beat United 1-0 and RVP gets 20 mins and feels the pain of debut defeat and loses to Everton for the first time, SHAME!!! Football back and nine months of heated debate. Crazy comments from experts and media alike and the continued Arsenal bashing, feels like it never went away. Thanks for reading and follow me on @harlowgooner. Happy new season to you! Pre Season was a bit odd with no outfield player playing 90 mins, I think this showed in the 2nd half where we just seemed a bit flat and with the exception of Cazorla, we showed very little attacking flair. I agree that the team will take some time to gel properly and hopefully when we do it will be back to those glory days of the not so distant past. Its sad to see star players leave every season, but why must they point at lack of success as there reason for jumping ship? were RVP, Nasri and the rest not part of that failed attempt at a trophy? Hopefully the new boys will quickly make us forget the old guard. I’m feeling very optimistic about the up coming campaign and hopefully the more experienced players Le Boss is now signing will help us push on to clinch some silverware come May.